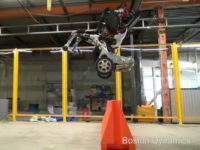 Robotics company Boston Dynamics released a video of its humanoid Atlas robot leaping through a parkour obstacle course this week. 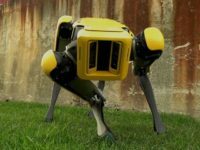 SoftBank’s Boston Dynamics robotics company published a video to YouTube demonstrating a far less creepy version of their four-legged SpotMini robot. 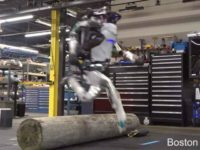 Boston Dynamics’ “Handle” robot looks like an impressive piece of tech, able to leap four feet in the air and confidently navigate varying terrain. 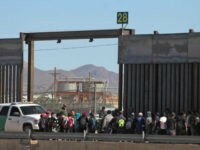 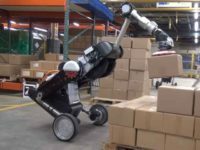 Google are reportedly “scaling back” support for its money-declining projects, including the viral Boston Dynamics robotics company, internet service provider Google Fiber, and solar-powered drones developer Titan Aerospace, which was recently closed down completely according to CBS News. 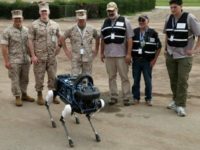 (Reuters) — Alphabet Inc (GOOGL.O) has put Boston Dynamics, part of its robotics division, up for sale for lack of revenue potential, Bloomberg reported, citing people familiar with the plans. 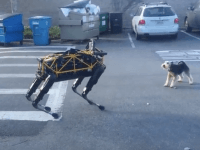 A recently released video shows a robot “dog” named Spot confronting a real Terrier named Cosmo in a San Jose parking lot–and driving the real dog crazy. 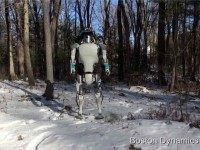 Boston Dynamics released footage of the latest version of their Atlas robot, and it’s mesmerizing. 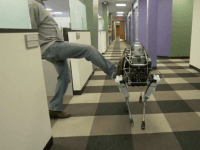 Boston Dynamics, owned by Google since 2013, has released a video of its new robot dog, Spot, in which workers try to kick it over, first gently and then more violently.